Smoothies are a great way to make sure you get protein, healthy fat and veggies in the morning. Plus, they are easy, quick and good to take on the go. When I know I have a busy morning, I pack my blender the night before, making breakfast fast & easy. Side note: don’t add liquid or nuts until morning for best results. Eating breakfast, especially with some protein, will help to balance your blood sugar through the day. This will decrease your cravings, make you feel more satisfied during meals and help you to not over eat during the day. It is the most important meal of the day! A healthy start leads to a healthy and productive day. 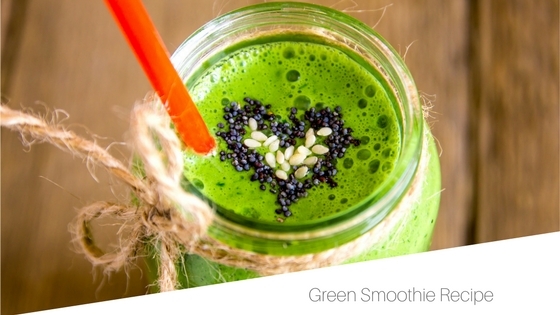 Here is a delicious and easy green smoothie recipe. Try it out and let me know what you think in the comments below.